Make a stylish impact in your space. The most loved of all seating: the sofa, couch, or 3 seater is an integral and important part of any deep seating collection. At Design Warehouse, we know this, which is why we have given you many an option to cater to your style; with different materials, designs and moods to adhere to your space. Whether you need something classic to fit into a traditional attire, or you’re gunning for state of the art, contemporary chic, we have masses of quality, luxury sofas to choose from! The word couch is taken from a French noun meaning to lie down, it has been anglicised to allow not just a restful daybed, but somewhere to sit in harmony, contemplating the best parts of life. The classic sofa enables you to relax in graceful style. A place to gather thoughts, host memorable parties, and ooze comfort when you most need it. A staple for any seating situation, the sofa offers a welcoming space for friends, colleagues, and family to come together, sharing in conversation, food and entertainment! One could argue that the sofa is the go to place for peace, comfort and serenity, which is why we have given you options to create a wonderful slice of harmony in your backyard, garden, verandah, or porch! Many of our couches are so stylish, they can be placed indoors as well as out! Just check out our new metal range of deep seating for sofas that pack an urban, industrial punch! Settle on your settee in comfort and ease! Within our extraordinary, limitless collection, comes high end, quality products that bode brilliantly in the great outdoors. Be dazzled by our time honoured teak sofas, laden with soft Sunbrella® cushions, which – in many different designs – give you the comfort of quality. The natural rubber in the teak, supports the sturdy framework of the sofa, and the deliciously comfortable and lush cushioning. These are couches you’ll melt into with delight. 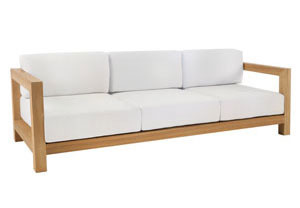 Check out the wicker variety of sofa units for modern materials in an array of arrangements. Made from a special UV treated polypropylene mix, Design Warehouse’s wicker ensures you can leave your items outside year round without worry of elemental deterioration. We are extremely proud to offer products that take the fuss and anxiety out of care. The maintenance is simple, so you can spend far more time relaxing! 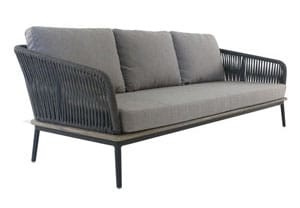 Other couches include the use of robust powdered coated aluminium or steel, woven rope, and raw concrete. All materials which offer up something unique, chic and opulent. Because your outdoor living room furniture is an investment that you have to love. Our sofas range in size from a modest 1.2 metres to a whopping 3 metres. Again, another example of offering you choice as you settle in to supreme style and comfort. Design Warehouse carries many other seating options to compliment your sofa or sectional unit. From the classic club chair, to bespoke loveseats, centre pieces and much much more, we are extremely proud to offer top quality outdoor furniture that enables you to bask in the luxury you deserve. Mix and match with the extraordinary array of dining tables – curating an area that allows you to indulge in gestation, relaxation, and stimulation! Pop into our amazing Parnell, Auckland showroom to see our outdoor sofas in person. The vast range of alternative items as well as the more traditional will leave you spellbound. Call us today to secure a sofa worth sitting on! You will be charmed by choice, dazzled by design and coerced by comfort. 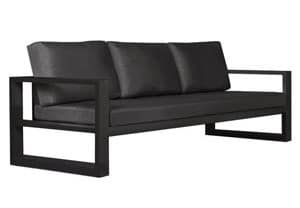 Purchase your outdoor sofa from Design Warehouse now.